You likely know that you should eat fat in moderation as excessive consumption of fat is bad for your health. Too much fat in your diet can cause a range of serious problems, including metabolic syndrome, cardiovascular disease and gastrointestinal issues. However, fat can also be a healthy part of your diet. Whether or not you're consuming too much fat comes down to the type of fat you're eating. Too much fat in your diet may lead to health complications such as cardiovascular disease, metabolic syndrome or gastrointestinal issues. The health risks of eating too much fat are typically associated with the consumption of unhealthy fats. Fast foods, refined foods and processed foods, which are very popular in Western diets, are full of unhealthy fats. According to a 2018 article in the American Journal of Lifestyle Medicine, at least 71 percent of Americans are overweight or obese. Many of these people suffer from other issues, like prediabetes or gastrointestinal inflammation. Many of the dangers of eating too much fat start with minor issues — like weight gain, digestive problems, high blood pressure and high cholesterol. However, these problems can often be mediated by simply eating a healthier diet. In many cases, you don't even need to reduce your fat intake — you simply need to make sure you're consuming healthier fats. Monounsaturated fatty acids: Monounsaturated fats, like oleic acid and other omega-9 fatty acids, can be found in plant-based cooking oils and other fatty plant-based foods, like avocado or coconut. You can also find these fats in some animal products. These fats are generally considered to be healthy but aren't usually considered essential. Polyunsaturated fatty acids: Polyunsaturated fats, like omega-3 and omega-6 fatty acids, can be found in a variety of foods like vegetables and marine products. 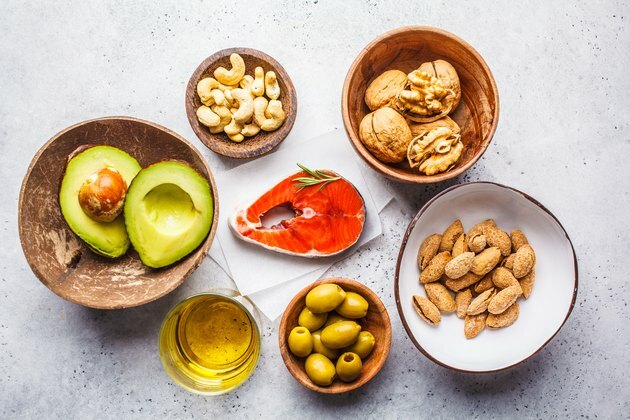 These are very healthy fats that play a role in the health of various different parts of your body, including your immune system, nervous system and cardiovascular system. They can also help lower cholesterol and triglyceride levels and certain types are even used to treat health issues. Saturated fats: Saturated fats are found in animal products like meat, eggs and dairy products, some oils and processed foods. These fats are OK to consume in moderation but shouldn't be eaten in excess. Unlike healthier, unsaturated fats, too much saturated fat can contribute to increased cholesterol levels and other health issues. Trans fats: Trans fats come from hydrogenated oils, processed foods and baked goods. These are technically the worst fats for your health, as even small amounts can increase your risk of heart disease and other problems. They can even affect neurodevelopment. However, certain trans fats with slightly different chemical bonds, like conjugated linoleic acid, are safe and healthy. According to the Food and Drug Administration, people who eat the standard 2,000-calorie diet should consume no more than 65 grams of fat each day. Most of these fats should be healthy fats, like monounsaturated and polyunsaturated fatty acids. Up to 20 grams of this amount can come from saturated fat. However, other authorities, like the American Heart Association, recommend consuming less (no more than 13 grams a day on a 2,000-calorie diet). There's no limitation on trans fat consumption — you should just try to eat as little as possible. As little as 5 grams per day has been shown to have a negative impact on your health. You've probably heard of high-fat diets (also known as low-carbohydrate diets). These diets direct the consumption of fat primarily on a daily basis. When you follow a low-carbohydrate, high-fat diet, like the Atkins or ketogenic diets, you're consuming about 20 grams of carbohydrates per day. This means that you're mainly eating fat — in fact, fat is 70 to 80 percent of your diet. High-fat diets, like ketogenic diets, are even able to reverse some of the issues associated with excessive consumption of unhealthy fats. This means that it's possible to eat a large amount of fat on a regular basis and still be healthy. Although these diets promote consumption of fat, people who follow them end up avoiding the vast majority of fast foods, refined foods and processed foods and don't eat many trans fats as a consequence. This is because high-fat diets focus on the consumption of large amounts of fats but few carbohydrates and only moderate amounts of protein. This means that even foods like fried chicken, which you might think would fill the bill, aren't suitable because they're breaded with high-carbohydrate grain products. Ketogenic diets also prevent you from consuming excessive amounts of animal products, as you're only consuming moderate amounts of protein. This means that while you may be consuming saturated fat on a daily basis, it's unlikely that you'd consume excessive amounts. The fat you consume should typically come from foods rich in monounsaturated and polyunsaturated fats, like fatty fish, extra virgin olive oil and fatty plant-based products, like avocado or coconut. Because carbohydrates are limited (other than healthy carbohydrates from fiber, which are good for your digestive system), people on healthy, high-fat diets typically eat carbohydrates in the form of vegetables or fruits with low sugar content, like raspberries.